Muse is an English rock band formed in 1994 that is famous for its energetic and extravagant live performances and the fusion of a variety of music genres like alternative rock, space rock, heavy metal, classical music etc. 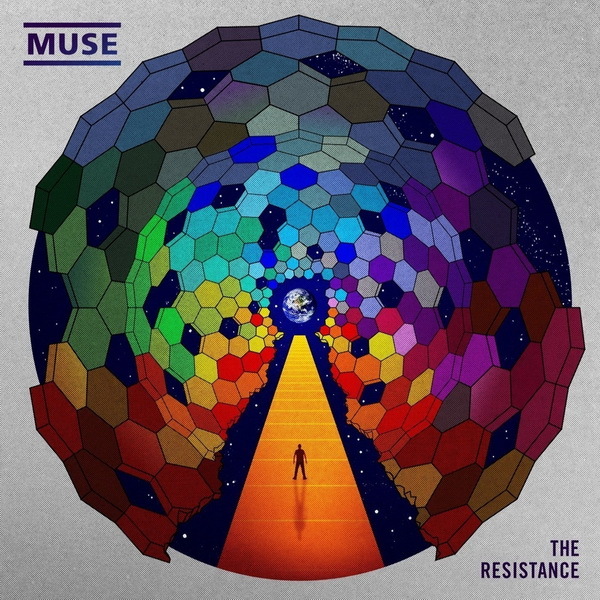 The Muse logotype, as seen on the cover artwork of their 2009 album The Resistance, is known to be designed using the Frutiger 65 Bold, which is designed by Adrian Frutiger in 1976 and you can purchase and download the font here. Frutiger font family is a series of typefaces named after its designer, Adrian Frutiger, who was commissioned to design a signage system for the new Charles de Gaulle Airport in Pairs in 1968. The font family was completed in 1976 and it turned out to be successful. The family was designed in a way that is neither strictly geometric nor humanistic and each individual character is designed to make sure they can be easily and quickly recognized even from the distances. Though originally designed for signage use on airport architecture, recently years saw its popularity in magazines, booklets etc. In addition to Muse, Frutiger typeface is also used in the following logos, movie posters or album covers etc., including: Scandlines, Relay For Life, Flickr, CNBC Logo, State Farm, GSA, NWA, TaylorMade, Deutsche Marine, 2016 Stanley Cup playoffs Logo, FIS Ski Logo, The Pokemon Company, TripAdvisor Logo, Alcatel Lucent, Theme Hospital.